After completing a gruelling 1,000 km cycling expedition from Sost in northern Pakistan to Hotan in Xinjiang last August, my friend Shahid and I thought it wise to switch to a more reliable means of transport to cross the dreaded Taklamakan Desert. We gifted away our bikes to two guides who had been of help in Hotan, and then booked our seats on what promised to be the best luxury bus service in Xinjiang. The bus terminal at Hotan was as elaborate as any airport terminal, with sparkling floors and stylish steel furniture. Sooner the announcement of departure was made, we walked to the bus parked just outside the waiting hall. After stashing the luggage in the cargo hold, the passengers were handed polythene bags by the driver, which got us wondering if these were some kind of air sickness bags. As we were boarding the bus, the driver told us to take off our shoes, put them in the bags, and enter barefooted. The excitement of entering a luxury cruise bus was rudely jarred by the sight of what we saw inside. There were thirty-odd stretchers in three rows, with half of them slung from the ceiling. The passengers seemed unfazed by the queer accommodation and promptly lay down, ready for the journey. The driver asked everyone to fasten the stretcher belts, lest there were falling bodies and broken bones. To someone not used to such luxury ‘sleeper’ buses – which are said to be common for inter-city travel in China – one could be excused for mistaking them for mortuary cadaver transports. 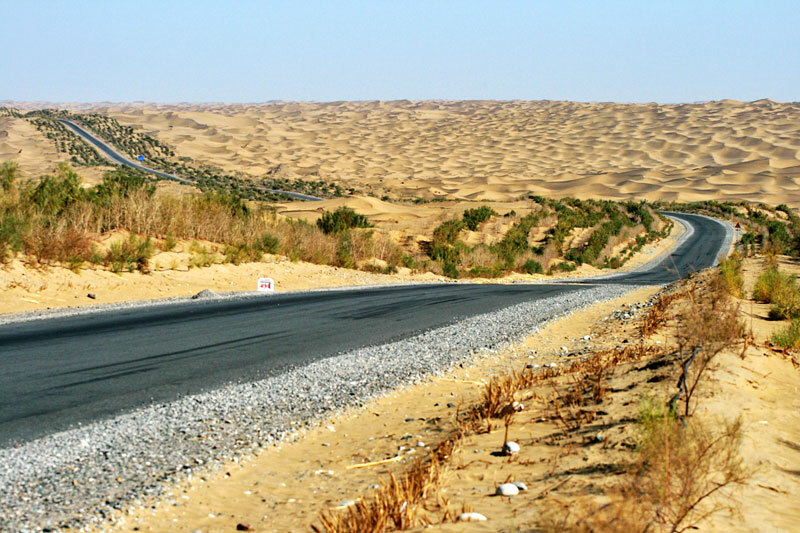 The 9-hour journey to Kucha (or Kuqa) across Taklamakan Desert offered just one monotonous view of sand dunes and occasional shrubbery – when not masked by a hanging blanket or a dangling leg from the upper berth. We had to go through police security check four times during the journey, with all passengers having to disembark and go through body scanners and scrutiny of documents. Inter-city travel in Xinjiang involves formalities no less than those at international border crossings. Irritating as it was, the security check was also a welcome break from lying down continuously and staring at the upper berth occupants, who had nothing better to do than gawking down in a similar wide-eyed fashion. Privacy as we know it, is little cared for, something we had unmistakably noted during our stay all over Xinjiang. We reached Kucha at night and checked in at the Kuche Grand Hotel. Well rested by next morning, we sauntered around the neat little city that was once a populous metropolitan centre of the northern Silk Road. The afternoon was spent at the rather decrepit mosque and tomb complex of Maulana Arshad-ud-Din Khan, a revered Sufi saint of the 14th century. The Maulana is famous for converting the first ruler of the Moghul Khanate, Tughluq Timur Khan along with his nomadic subjects, to the Islamic faith. This Mongol tribal confederacy held sway around the Tarim Basin and the steppes further north, for over two centuries starting 1347 AD. Before the advent of Islam, Kucha was an important Buddhist kingdom on the northern Silk Road. We had several hours to spend at leisure, as our train to Urumqi was to leave late at night. After a late lunch at the aptly named Maulana Restaurant, we idled in a small peaceful park, with none of the boisterous public activities to disturb us. We noted that the farther east one went from Kashgar, less conservative the Muslim Uyghur lifestyles became, as was quite evident on the streets of Kucha; this was perhaps due to the growing influence of the more secular and worldly Han Chinese (the majority ethnic group in China), whose numbers in Xinjiang have continued to increase over the years. Late in the evening, we left for Kucha Railway Station to board the train for Urumqi. After collecting snacks from shops outside the station, we queued up for scrutiny of our tickets and passports, followed by a thorough luggage and body scan. 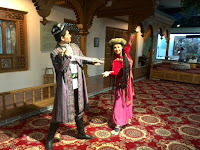 The waiting hall was jam-packed with passengers of many hues – Kirgiz, Kazakh, Uyghurs, Han Chinese, Europeans, Japanese, and the two of us from Pakistan. After waiting for two hours, the announcement about arrival of the train was made. Almost two hundred passengers shuffled up the stairway to the elevated platform. Used to our chaotic multitudes storming the railway stations, we were surprised to see not a soul on the platform, no hawkers selling snacks, nor any busy-looking railway officials. Before the crowd could break off into disorderly flocks, a young uniformed policewoman emerged from nowhere, and ordered everyone to form up in a perfect square, pointing at the painted lines on the platform. Next, she started a harangue on her cordless microphone, which blasted her voice on loudspeakers in the middle of the night. We could not understand a word, but going by her vociferous commands for everyone to stay quiet and not to use the cell phones, we knew she meant serious business. Her instructions would take a menacing tone every now and then, much like that of a drill sergeant. The high pitched lecture continued for good fifteen minutes, and we figured out that she was probably telling the passengers about the dos and don’ts of travelling on train, much like the cabin crew do on airliners. We heaved a sigh of relief when she finished her sermon on spotting the arriving train’s gleaming headlamp at a distance. All was quiet when another young policewoman with a red band on her peak cap, marched across the platform right up to the edge, and stood at attention next to the railway line. As the train slowed down to a walking pace, the engine driver craned his neck out of the window and saluted the lady, who reciprocated with a crisp salute. When the train halted, about 20-odd uniformed conductors alighted, one from each compartment, and helped the passengers board the train. In precisely five minutes, over two hundred passengers had boarded, the engine driver and the policewoman again exchanged salutes, and the train was on course to Urumqi. We had a very comfortable night in the deluxe train, a far cry from the ‘sleeper’ bus that we had travelled in, two days earlier. We woke up to the view of Tian Shan Mountains in the distance, which was much better scenery than the uninteresting Taklamakan Desert. Windmills for power production could be seen for miles before we neared Urumqi’s industrial zone on the city’s suburbs. As the train closed in on Urumqi, we could see a riot of skyscrapers in the modern capital of Xinjiang-Uyghur Autonomous Region. No building older than fifty years remains, we were told by a local contact who had come to pick us up at the station. Winding his way through thick morning traffic, Mr Liu dropped us off at the Tamaris Grand Hotel, popular amongst the Uyghur community for its halal food and central location. 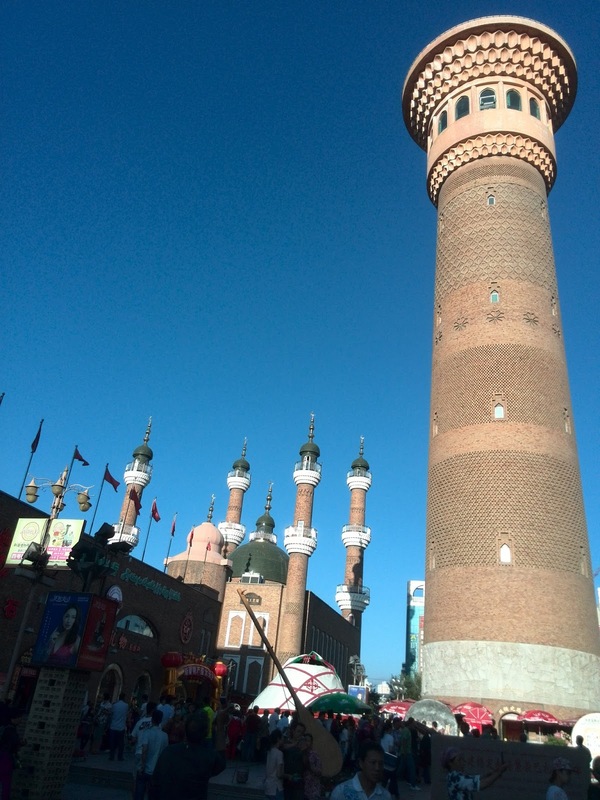 With no business meetings to attend to, nor financial deals to cut, Urumqi offered us little by way of sightseeing. 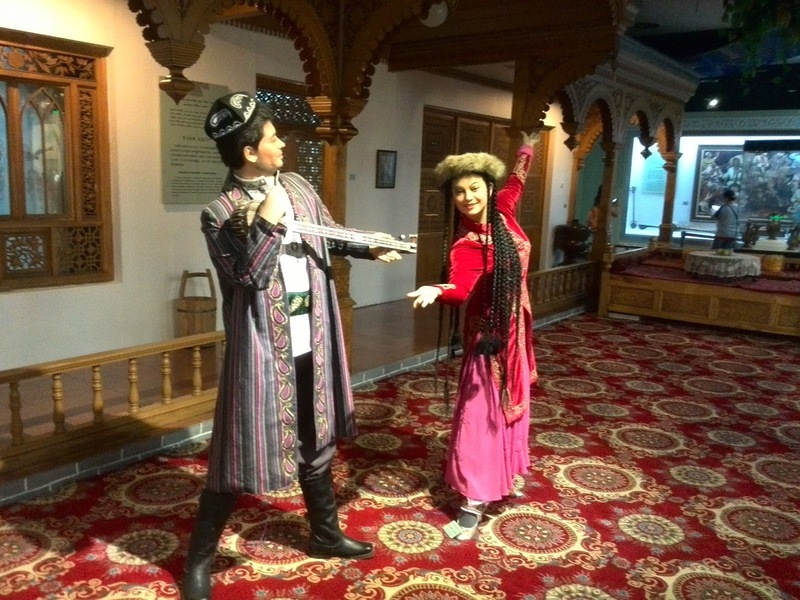 For starters, we chose the Urumqi Regional Museum, which showcases local ethnography under the theme of ‘one China, many faces.’ The famous Tarim mummies dating from 1800 BC to the first century AD were also on display. The mummies are said to belong to speakers of the defunct Tocharian language, who purportedly came from the Bactrian (Balkh) region in present-day Afghanistan. Colourful mannequins of all ethnic minorities of Xinjiang depicting scenes of daily life, were also on display. In the evening we made a round of the International Grand Bazar, within walking distance of our hotel. An attractive brick mosque with a green dome, stands out in the middle of the bazar, in a scene reminiscent of Timurid Samarkand or Bukhara. The wares sold at the bazar include clothing, jewellery, carpets, and handicrafts. Roadside eating stalls run mostly by women promise mouth-watering skewered kebabs and laghman (noodles), while street hawkers sell everything from almonds to water melons, to all-purpose potions. For the better part of next day, we were guests of a well-heeled Pakistani businessman. The gentleman is well-connected too, for he is married to a once famous Uyghur actress. He enriched us with his knowledge of local customs, culture and society. We learnt that there are more than a hundred Pakistanis in Urumqi who bring in handicrafts and sundry items, and sell them off profitably. 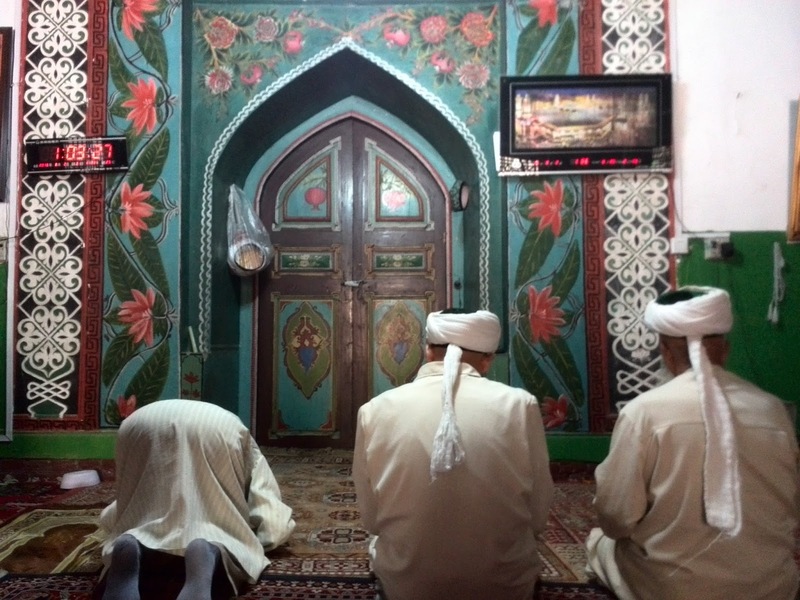 Friday prayers at a nearby mosque were widely attended, with Pakistanis outnumbered only by the local Uyghurs. The Hui Muslims (converted Han Chinese), do not pray alongside Uyghurs and have their own mosques, we learnt to our surprise. Together, the Uyghurs and Hui Muslims form less than a quarter of Urumqi’s population, while the Han Chinese are in a majority with three-fourths of the total. The Uyghurs seem to be outsiders in their own capital city. Nearly a month had passed since we had started our cycling expedition into China. It was time to pack up and go, by yet another means of transport – the aeroplane. After a most memorable adventure, we were soon on our way to Islamabad, overloaded with stories of discovery that have been told and retold, ever since. I am reminded of novelist Margaret Thien’s observation about the people in China, that ‘you learn a lot from what they don’t tell you.’ It was just as well that we could not communicate in their language, for we would have been told much less than what we discovered all by ourselves! This article was published in the daily newspaper The News International on 6 Nov, 2016.